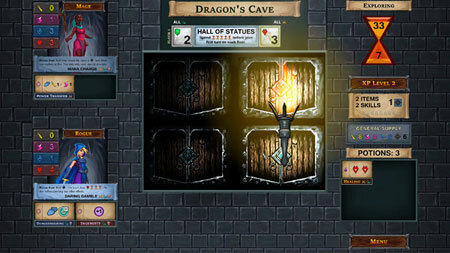 One Deck Dungeon is a dungeon crawling adventure game developed by Handelabra Games. Each time you play, choose one or two of these 5 brave heroes – Mage, Warrior, Rogue, Archer, and Paladin. It lets you jump right in to bashing down doors, rolling dice, and squashing baddies with style. Get a full roguelike game experience, boiled down to its essence, and captured in a single deck of cards and a handful of dice. After every game, your heroes make progress toward unlocking up to 15 new talents, building up their power for future games. There are 5 dangerous challenges to face – Dragon’s Cave, Yeti’s Cavern, Hydra’s Reef, Lich’s Tomb, and Minotaur’s Maze. If you get stuck in the game, check out the video walkthrough and gameplay for the game. This entry was posted in PC Games, Walkthrough and tagged One Deck Dungeon Cheats, One Deck Dungeon Game, One Deck Dungeon Gameplay, One Deck Dungeon Guide, One Deck Dungeon Hints, One Deck Dungeon Review, One Deck Dungeon Solutions, One Deck Dungeon Strategy, One Deck Dungeon Tips, One Deck Dungeon Walkthrough by Marvin. Bookmark the permalink.